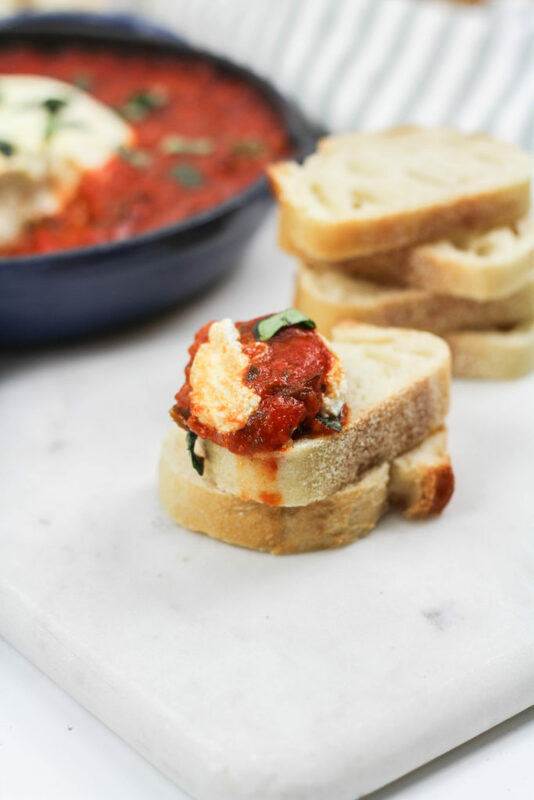 You only need 4 ingredients to create this baked goat cheese appetizer that’s quick to make, delicious, and will wow your guests! Check out the easy recipe! 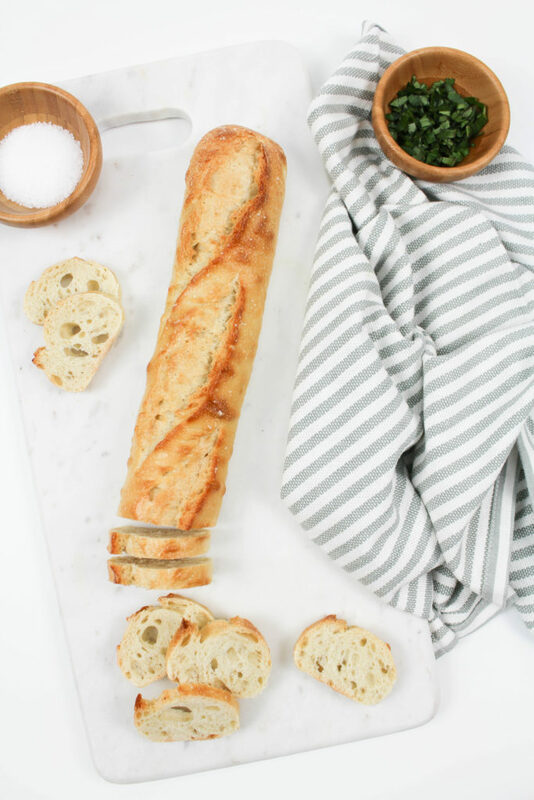 The Oscars are only a day away and, so far, I’ve prepped you with a delish and easy cocktail recipe, some DIY napkins that will wow, and yet we’re still missing a little something…maybe a yummy appetizer? If you’ve ever been to Las Vegas and dined at Mon Ami Gabi, you might have noticed (or tried!) one of the apps on their menu…it’s an addicting baked goat cheese appetizer that does not disappoint. At all. It’s one of my very favorite things to indulge in while I’m there (besides the french toast), and it also happens to be something that would pair perfectly with an at-home Oscar’s viewing party! The recipe, although not from the chef at Mon Ami Gabi, is fairly simple to re-create and one that will impress your guests, with little to no effort by you. Keeping you out of the kitchen AND able to enjoy your guests and the Oscars…? Hosting win. Cut your fresh basil into pieces and set aside. Shape your goat cheese into a round ball and press into the center of your baking dish. Slowly, and carefully, pour your marinara sauce around the goat cheese ball, filling the baking dish. 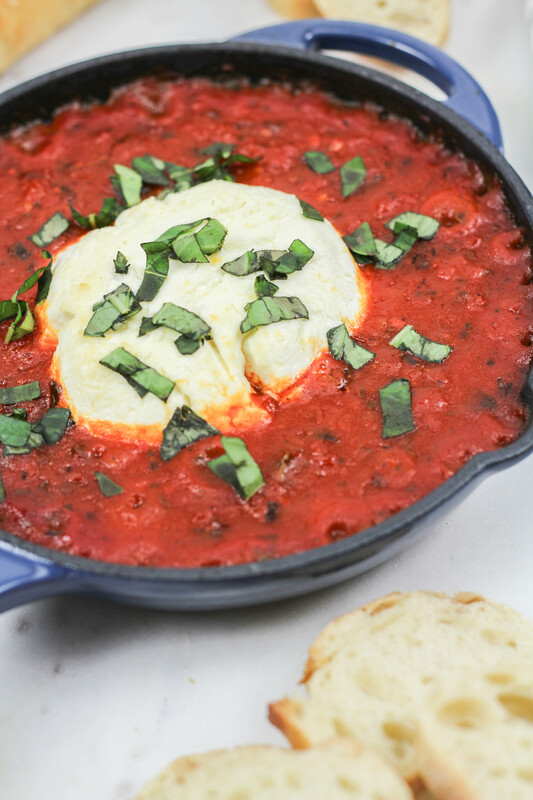 Bake for 25 minutes, until the marinara sauce is bubbling and the cheese is starting to melt. 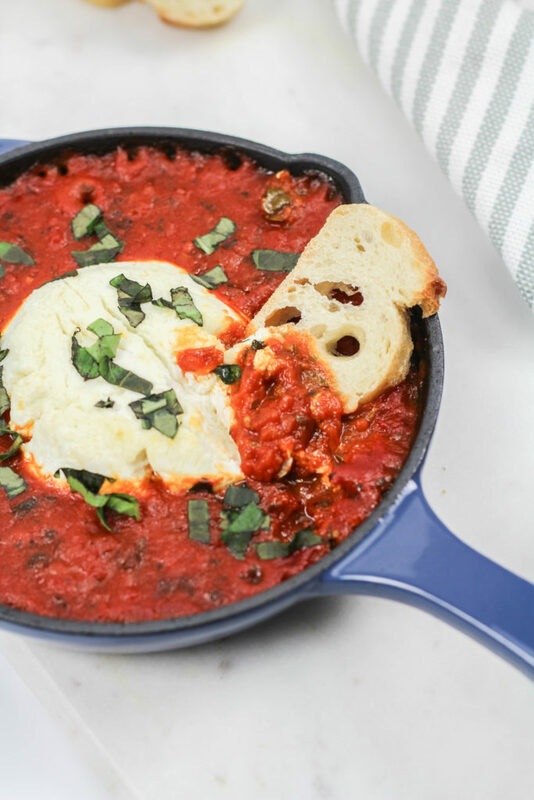 Remove from the oven and top with your fresh basil. 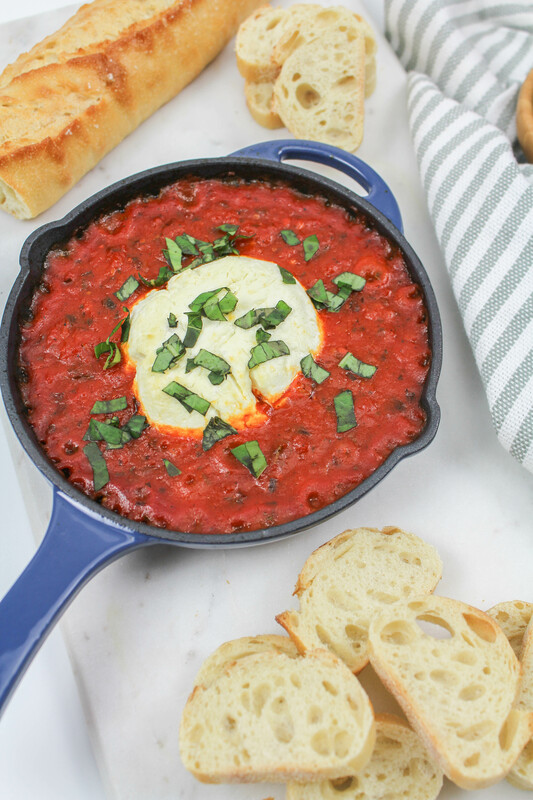 Serve immediately with fresh bread or crackers to dip! 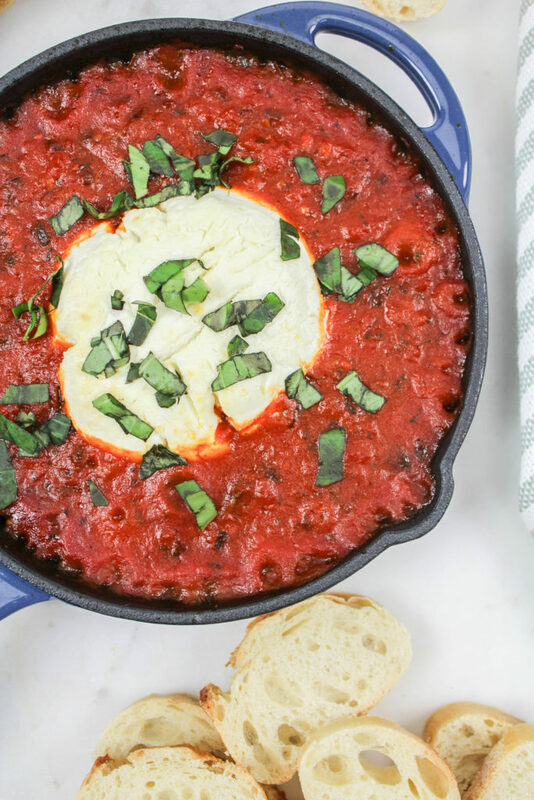 This baked goat cheese appetizer really couldn’t get much easier and it’s delicious. Addicting too. (I warned you). This appetizer would also be so cute as mini individual portions using ramekins, instead of a larger baking dish. Perfect to set out on each guest’s plate at a fancy dinner party!